How Do I Resolve File Conflicts? 1. 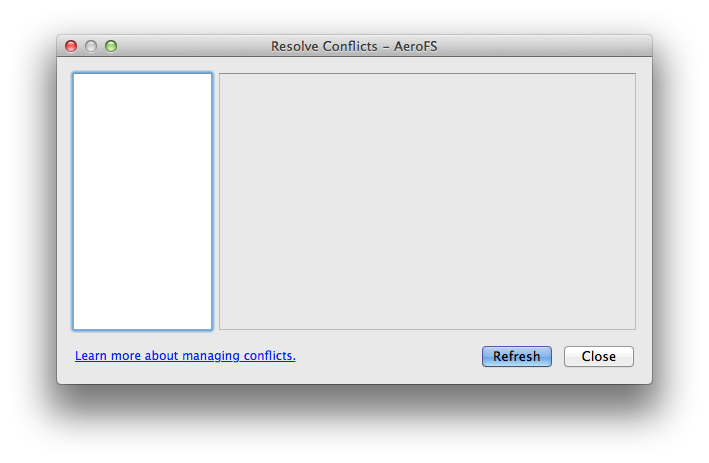 Clicking on the AeroFS icon > A conflict was found will allow you to view and manage file conflicts. 2. Conflicted files can also be identified by the yellow fork icon superimposed onto the file's thumbnail. Right-clicking on the file > AeroFS > Resolve Conflict... will allow you to view and manage the file conflict. 1. Click Delete under "Version 2" to delete the version of the file stored on the other computer. 2. The conflict should now be resolved and it should disappear from the "Resolve Conflicts" window. The conflict should be resolved on the other computer as well. 1. 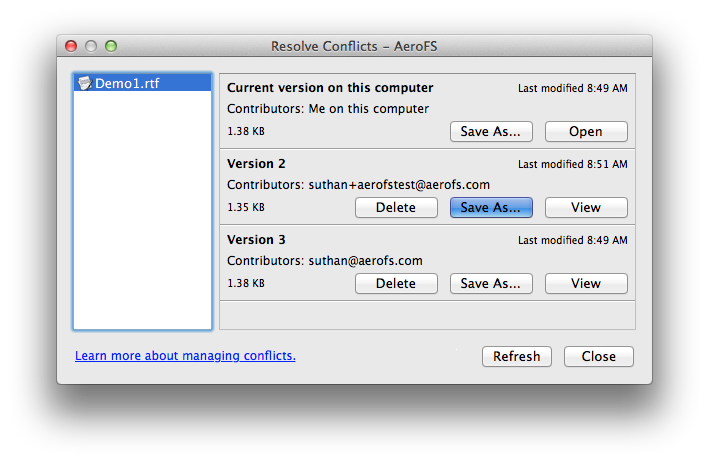 Click on Save As... under "Version 2" to save the remote version of the file locally on your computer. 2. Click Save to overwrite the existing version of the file on your computer. 3. Click Replace to confirm that you wish to overwrite the existing file on your computer. 4. The conflict should now be resolved and it should disappear from the "Resolve Conflicts" window. The conflict should be resolved on the other computer as well. The following steps can be used to solve any conflict between any number of computers. 1. Click Delete under "Version 2" to delete the version of the file stored on the second computer. 2. Click Delete under "Version 3" to delete the version of the file stored on the third computer. 3. The conflict should now be resolved and it should disappear from the "Resolve Conflicts" window. The conflict should be resolved on the other computers as well. 1. Click on Save As... under the remote version you wish to keep. In this example we choose to keep "Version 2". 2. 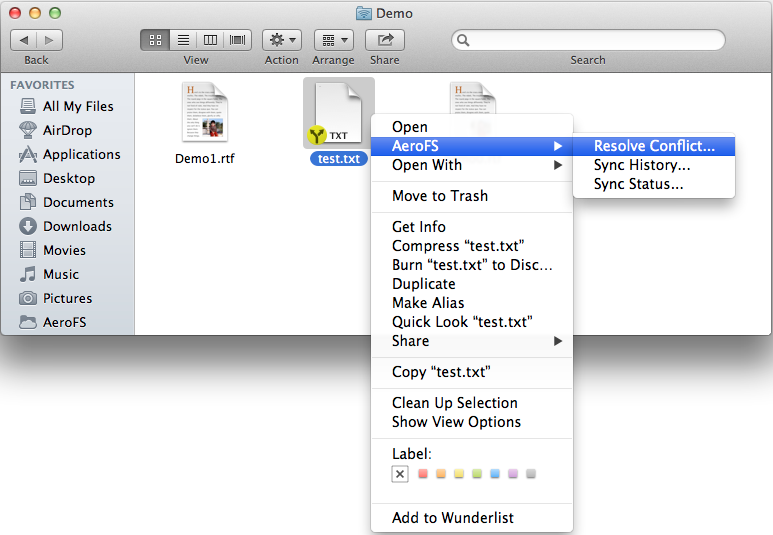 Click Save to overwrite the existing local version of the file with Version 2. 3. 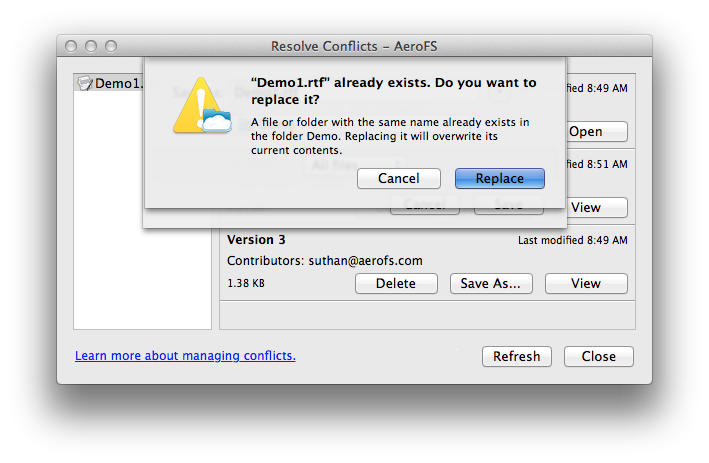 When you are prompted whether or not you want to replace the existing file, click Replace. 4. Now the versions on the other computers need to be deleted. In this case we click the delete button under "Version 3". 5. The conflict should now be resolved and it should disappear from the "Resolve Conflicts" window. The conflict should be resolved on the other computers as well. How can I handle unsyncable files? How do I install the AeroFS Desktop Client or Team Server on a headless device?